ROLL up, roll up, one and all, for Disney’s latest live-action remake of an animated classic, with Dumbo (Cert PG, 112 mins), the tale of a baby elephant that can fly. But will the latest wannabe hit from the Mouse House soar to the top of the circus tent, or is it something of a beastly film? In fact, Dumbo lands somewhere in the middle, with the film wobbling along in parts but eventually finding its feet – just like Dumbo! And that’s enough metaphors, with it being time to present a much more straight-laced review. Straight-laced is also the approach that director Tim Burton takes here, with Burton toning down his usual excess to present a more restrained film. Here, his remake is almost twice the length of the 1941 classic animation, requiring plenty of additional details, but without straying too far from the original tale. Set in a pre-Depression America, a former circus star and dad to two kids Holt Farrier (Colin Farrell) returns from war. He’s lost an arm, and his wife has died, leaving him with two bright kids to raise alone at the struggling circus, whose boss, Max Medici (an enjoyably great Danny DeVito) gives him a lowly job caring for the elephants. 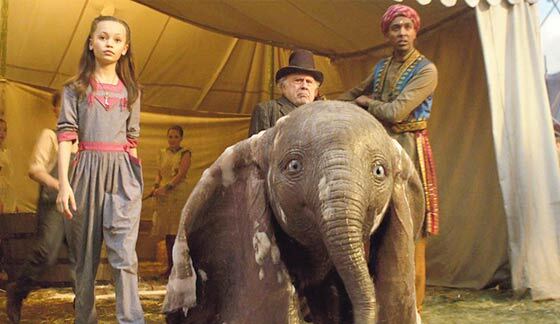 After something of a pregnant pause, enter Dumbo: the goofy-looking baby elephant with giant ears, mocked by everyone but embraced by Holt’s kids, who take to caring for the isolated animal after its mother is separated. Cue an uplifting discovery in the most literal sense, when it’s discovered that Dumbo can fly, courtesy of those outsized ears, with his amazing ability proving just the (circus) ticket to turn the roaming roadshow’s fortunes about. Dumbo’s discovery soon reaches the ears of would-be elephant empresario Vandemere (Michael Keaton), who knows that Dumbo would be the perfect attraction for his razzle-dazzle, glitzy Dreamland complex, with the circus folded into its attractions. As you’d probably guess, however, a truer name for the complex would be Nightmareland, with a grim, cruel future for Dumbo soon revealed. They may be strictly a small-time crew, but Max, Holt, the kids and the carnies have much bigger hearts than even an elephant‘s, with the gang determined to save Dumbo from an unhappy life. As I said, despite being about another fantastical subject, director Burton generally keeps things much more down to earth than seen in several films. There are a few directorial flourishes from him, but Dumbo plays out pretty much on the level. Long-time Burton fans will enjoy seeing DeVito and Keaton reunited, after their terrific pairing in Batman Returns (1992), though here they reverse their hero/villain status, and Eva Green is reliably great as a trapeze artist. Perhaps Burton has played things too straight – Dumbo’s a generally sweet remake with some dashes of darkness, but some tart touches could have added a little more flavour to the tale. On the whole, however, it’s a decent family film. While it’s as plodding as an elephant in parts, Dumbo generally finds a way to entertain.